SES leads a European consortium of industry partners to sign an agreement with the European Space Agency (ESA) to set up Pacis-1, a new satellite communication platform for governments that is aimed at making secure satellite communications accessible and available to governments and institutions. 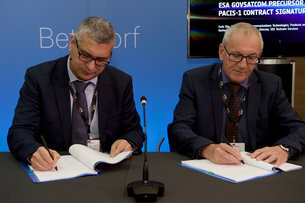 Pacis-1 is part of the ESA’s Govsatcom Precursor programme and is the first step in demonstrating how the European space industry can support the EU’s Govsatcom initiative and leverage governmental and commercial satellite services to provide secure access to satellite communications for a wide range of governmental applications. The project will demonstrate in-field usage of the system for civil protection, border control, humanitarian missions, maritime surveillance, among other applications. Under the agreement, SES will put in place the architecture and service concept of Pacis-1, leveraging the space assets and ground infrastructure of the stakeholders involved in the project. Under the Pacis-1 public-private partnership, the members of the consortium will be providing specific technological contributions, including engineering, satellite capacity, commercial, project management and other services. Other industrial partners that have joined the SES-led consortium are Redu Space Services, GovSat, Newtec, QinetiQ and Tekever. “Pacis-1 is an excellent example of how a Public-Private Partnership at the national level - between a commercial operator and a Member State - can evolve in a wider European setting with the support of ESA, to prepare for EU Govsatcom. The pooling & sharing demonstrations are hosted in a European Centre of Excellence for space cyber security services, and may provide the Centre with the opportunity for an operational role in governmental secure Satcom at EU level,” said Carlo Elia, Head of the Telecommunications Technologies, Products and Systems Department, ESA.